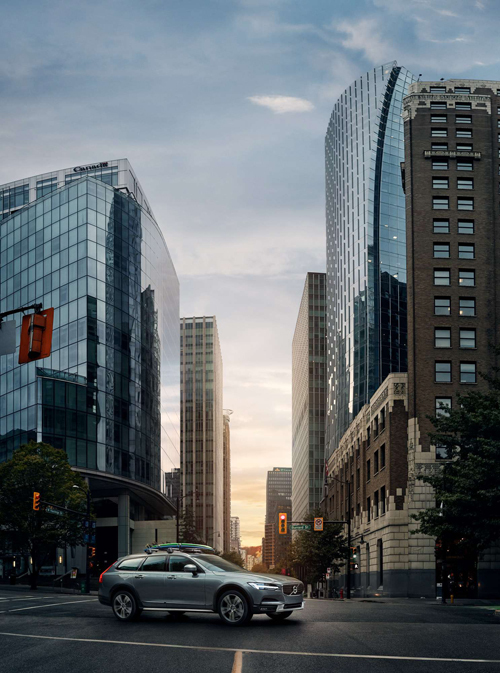 2017 – Volvo V90 Cross Country on the corner of Burrard St and West Hastings St in Vancouver, BC, Canada. Hastings Street is one of the most important east-west traffic corridors in the cities of Vancouver and Burnaby, British Columbia, Canada, and used to be a part of the decommissioned Highway 7A. In the central business district of Downtown Vancouver it is known as West Hastings Street; at Carrall Street it becomes East Hastings Street and runs eastwards through East Vancouver and Burnaby. 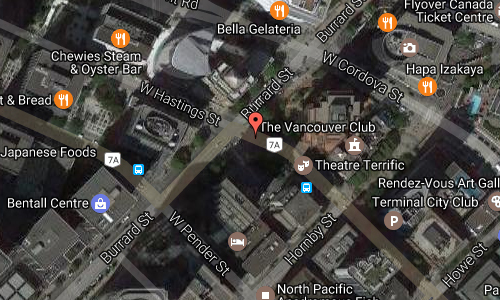 Burrard Street is a major thoroughfare in Vancouver, British Columbia, Canada. 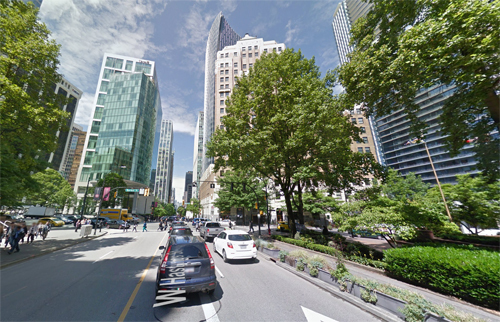 It is the central street of Downtown Vancouver and the Financial District. The street is named for Burrard Inlet, located at its northern terminus, which in turn is named for Sir Harry Burrard-Neale. The street starts at Canada Place near the Burrard Inlet, then runs southwest through downtown Vancouver. It crosses False Creek via the Burrard Bridge. South of False Creek, on what used to be called Cedar Street before the completion of the bridge in 1932, the street runs due south until the intersection with West 16th Avenue. The intersection of Burrard Street and Georgia Street is considered to be the centrepoint of Downtown Vancouver, along with the more tourist-oriented and upscale shopping-spirited intersection of Burrard Street and Robson Street to the south. At and due northeast of the centre is the heart of the Financial District. Further down closer to Vancouver Harbour stands the historic Marine Building, an Art Deco masterpiece, opened in 1930, two years before the Art Deco pylons of the Burrard Bridge at the opposite end of the street. Finally at the Harbour lies Canada Place and the Vancouver Convention Centre. 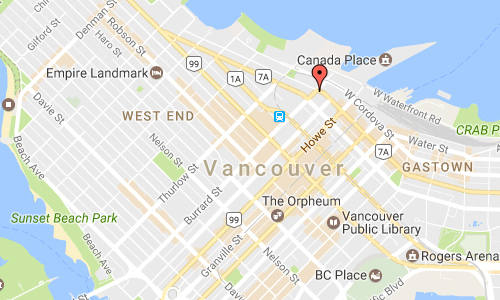 The Financial District is a highrise office area of within the central business district of in Vancouver, British Columbia’s downtown peninsula. Located roughly along Burrard and Georgia Streets, the Financial District contains more than 60% of Greater Vancouver’s office space and is home to headquarters of forest products and mining companies, federal and non-governmental organizations (NGO) offices, Overseas missions and consulates, and headquarter and branch offices of national and international banks and financial services, accounting and law firms, and luxury hotels. More information at en.wikipedia.org and en.wikipedia.org/wiki/Financial_District.